Congratulations! and we look forward very much to sharing in your service in church. We pray that God will bless your marriage and be with you in a special way as you embark upon the wonderful journey of marriage. Yes! 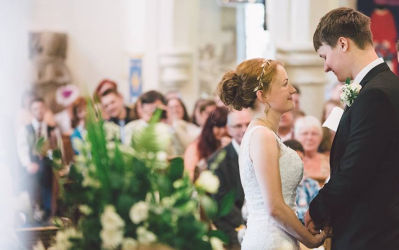 you can marry in our church if one of you lives in the parish or regularly attends the church. You have previously: lived in the parish, worshipped at the church, or were baptised there. Also if any one of your parents after you were born has lived in the parish or been a regular worshipper in the church. You are also entitled to be married here if any of your parents or grandparents were married in the church. Previously married divorcees under certain circumstances can also be married if they fulfil the above criteria. We also perform special Services of Thanksgiving for marriage following a civil ceremony or on special anniversaries.